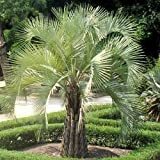 Butia capitata growing palm tree of the genus Butia also known as Jelly palm, Butia capitata perennial evergreen plant an mostly used as ornamental plant, can grow in mediterranean, desert, subtropical or temperate climate and growing in hardiness zone 9+. Butia capitata COLD HARDY JELLY PALM Seeds! 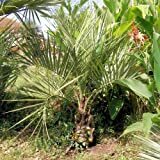 Butia capitata strictior UPRIGHT HARDY JELLY PALM Seeds! What can be done with big quantities of Butia capitata fruits?